Ten-man Hamburg maintained their 100 per cent record with an entertaining 3-1 victory at Cologne and moved to the top of the Bundesliga table for the first time in eight years. 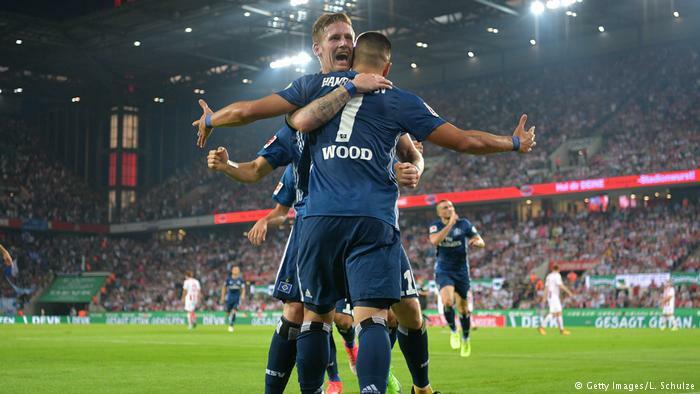 First-half goals from Andre Hahn and Bobby Wood set the visitors on their way and, despite the dismissal of defender Mergim Mavraj against his former club and a late Frederik Sorensen goal, substitute Lewis Holtby sealed their second win of the season in the 10th minute of stoppage-time. Yuya Osako came close to opening the scoring for the hosts but was denied by a great save by Hamburg goalkeeper Christian Mathenia before Hahn broke the deadlock in the 28th minute at the other end. Cologne failed to deal with Filip Kostic's corner and the ball fell to the forward to rifle in his first-ever goal for the club with a half-volley from the edge of the area. Six minutes later, Wood doubled the visitors' advantage after Gian-Luca Waldschmidt's wayward strike fortunately fell into the American forward's path, who slotted past the onrushing Timo Horn. Jhon Cordoba was inches away from halving the deficit but his effort clipped the post before the match was delayed for 10 minutes after referee Felix Brych had to be replaced due to a calf injury. Fourth official Soren Starks took his place and was immediately brought into action to show Mavraj his second booking for a late tackle on Cordoba. Sorensen pulled a goal back for Cologne in the ninth minute of stoppage-time with a deft finish from Cordoba's knock-down but former Tottenham midfielder Holtby tapped in a minute later following a mazy run and cross from Albin Ekdal.